If no signal is plugged to the right input, then left input will be sent to both Left and Right outputs. “Level” knob adjusts output level for Left and Right channels. Price -100 USD or 88 Euro. Looking great. Can you tell anything about the transformers? Do they also add a bit of that magic colour that we all seek? I use NOS soviet transformers. As usually with audio transformers - they introduce harmonics for low frequencies. So 60 Hz sine wave of 10 V p-p has around 1 % of THD, less distortions for lower volume or higher frequencies. Some people just like transformer sound, but I personally can not get any sound difference. I quickly switched original audio and the audio passed through this module and found no difference. I may upload some audio recorded through “Isolator”, so anybody interested can check. Does it retain the level of the signal ? Yes, the level is almost the same at fully CW position. Thanks to everyone who express the interest in this module. I’m now ordering parts to assemble more modules, will inform as soon as the modules will be available again. Great news! igorrr do you plan to make also an input module with transformers? Looks like the input module is interesting for many, so will consider it for sure. I really like this module and the idea. However, having recently purchased the "Out" module from you, which is just perfect with the lovely meter and dual ins, I will probably not buy the isolator, even though it would be nice to have a galvanic isolated out. Might end up getting one anyway though, ha ha. Massive Happy Nerding fanboy over here! It is already done. Isolator has receiving connection and OUT has sending socket – can be seen if the module is removed from the case and looked from the side. Of course you thought about that. Will both outputs work in parallel then? As in, can I pull signal from both the "out" and the "Isolator" at the same time? Yes, both outputs work independently. Level which you set with the smaller knob of your OUT module will be copied to the Isolator’s input and then can be additionally decreased with the Isolator’s “Level” knob appearing at the transformer isolated outputs. Isolator’s panel 1/8 inputs will still work allow adding another stereo signal. Any idea when these will be available in the states? Looking to pick up a pair. Sorry, can not indicate the date yet. Do they also add a bit of that magic colour that we all seek? Some people just like transformer sound, but I personally can not get any sound difference. I quickly switched original audio and the audio passed through this module and found no difference. take this as a hint in some direction and not as a real review or the truth, i´ve not patched much. ( I mainly made some tests when i got my isolator. but those quite thoroughly cause i wanted to clear something for me upfront. to me it (absolutely) colours the sound, but it much depends on the source. in most cases could i hear a difference. in some cases was no difference at all recognisable to me, or just super subtle. so i´d say it shifts the frequenzy content a bit, more bass , less highs and anyway less agressive highs, shaping transients off in the highs i suspect. i think the module is supergreat ! and for that price anyway !! I´d say: just don´t expect this module to sound neutral ! As already been mentioned, OUT module can be connected to the Isolator via a separate stereo cable on the back side. Latest revision of PanMix now has the same out connector, so can be connected too. And freshly announced PanMix Jr also has this feature. How it works: you connect the provided cable to the PanMix Jr “Out” connector on the back and the other side is connected to the Isolator’s connector. This way stereo output from PanMix Jr is mixed with the stereo signal connected to the Isolator’s front panel inputs. Level knob adjusts amplitude of the front panel inputs. So in just 10 HP of total space you get 3 panned channels mixed to another adjustable stereo signal, which is then sent to transformer isolated output on reliable ¼ jacks. 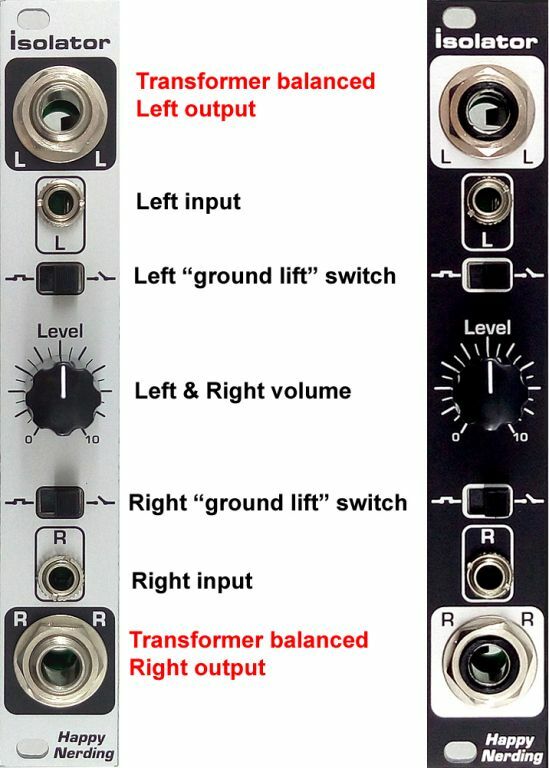 I´m planning my 1st eurorack and I´m trying to figure out if i should get this module or the OUT module. I actually don´t need the headphones amp, but maybe I could benefit on the mixing capabilities of the Out module. The Led meters are also good. What it´s not clear to me is if there is any benefice on getting this module over the Out one (aside fromsaving 2hp). Both offer balanced outputs, right? Does the galvanic isolation on this module offer a cleaner output than the the Out module? Yes, both have the balanced outs. Galvanic isolation gives benefits only if there are some ground loop issues. And in such satiations it is still better to resolve the problem first, before trying to get rid of the hiss/hum with galvanic isolation. But if you plan to travel with your case and it will be a part of different live setups – Isolator is a good solution to be safe from most of the troubles. Thanks for the explanation. As i´m planning to use my system for a live act, I think the Isolator will be the winner. I bought one direct from Igor, and loved it. Really sounds amazing (very clean, with just a tiny bit of added warmth), built like a tank. It makes me want other happy nerding modules. I have an RIP and a Please Exist and, to my mind it has a slightly different character to the former, but probably is better for many things. Compared to the Please Exist MK1s it puts out a much hotter output, and of course, the balanced outs and ground lift make it much cleaner. This is definitely the best "bang for your buck" output module on the market.